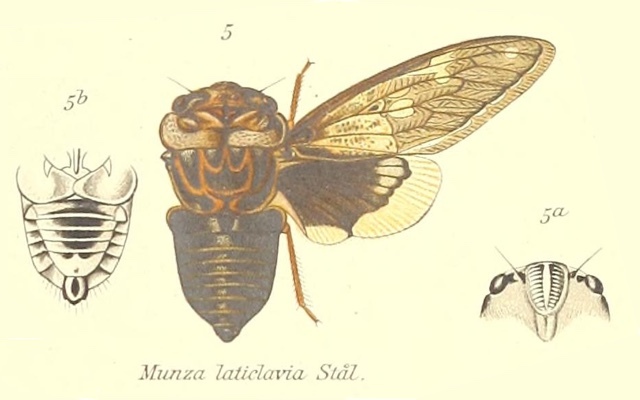 There are three subspecies of Munza laticlavia: M. laticlavia laticlavia (Stål, 1858), M. laticlavia lubberti Schumacher, 1913 and M. laticlavia semitransparens Schumacher, 1913. It is found in southern Africa, including the countries South Africa & Nambia. Perhaps Kenya too. Characters. — Head (including eyes) a little wider than base of mesonotum, subtruncate and deflected in front of eyes; pronotum transverse, about as long as mesonotum, its posterior margin a little more than half the length of its vertex, its lateral margins dilated and a little angulated, but not reaching the basal cell of tegmina; anterior femora not spined ; posterior tibiae longly spined on their apical halves; metasternum a little elevated and centrally sulcate; tympanal coverings somewhat small ; opercula short, broad, their lateral and posterior margins a little oblique and sinuate ; rostrum reaching the posterior coxae ; tegmina with the basal cell broadened apically ; wings with the outer and posterior membrane Very broad, about one third their length.